A failing wheel bearing is never a comfortable feeling. Usually, you hear it before you feel it. This sound ranges in volume from a slight hum, to something like you're standing next to a helicopter. Luckily though, on an MK5 GTI, replacing the rear wheel bearings is a job that most anyone can do at home. Charles (HumbleMechanic) Sanville walks us through how to diagnose and replace those worn out rear wheel bearings. As always, it's important to properly jack up your car. Don't rely on a single jack; add jack stands and blocks as back-up. It's easier to diagnose bad rear wheel bearings with the rear of the car in the air, with both wheels are off the ground. There's a special tool for this job, but a flat chisel does well enough. The new rear wheel bearing comes with a new dust cap, so no need to be gentle here. This step will more likely than not be the most frustrating part of the entire job. I suggest soaking these bolts in penetrating fluid long in advance. If they've never been removed before, they won't want to budge. These bolts are 14mm triple square. Make sure your socket is seated completely into the bolt before trying to break them free. If necessary, use a hammer to make sure it's securely seated. Use a breaker bar or the longest ratchet you can get in there instead of an impact; there is a good chance of stripping these out with the latter rather than the former. 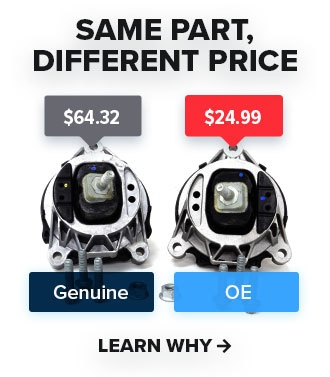 Now you can remove the entire rear caliper and bracket at once. Use a bucket or wire to support the assembly so you don't put stress on your brake line. Using a T30 Torx socket, remove the screw that fastens the rotor to the hub. These also have a tendency to be seized, so a liberal application of penetrating fluid is advised. Now you should be able to remove the rotor. If it doesn't want to come off, a few taps with a dead-blow or wooden mallet should do the trick. Step 5: Remove Wheel Hub Bolt and Wheel Bearing. Your old wheel bearing should come off easily. Be sure to clean up the spindle before installation of the new wheel bearing. Any rust or debris can cause it to bind and not be installed easily. The new rear wheel bearing should slide onto the spindle easily. If it doesn't, you have an obstruction. Once you have the new wheel bearing in place, you can install the new bolt. Using a torque wrench and your 18mm triple square socket, torque the bolt to 180Nm. After that, you need to tighten another one hundred and eighty degrees. You can do so by using a marker for alignment and a breaker bar. We're to the point of reversing the steps from above for re-assembly. Put the brake rotor back on the hub and rotate until the set screw hole lines up. Install the set screw and torque to 4Nm. Lastly, put the new dust cap in place and gently tap in place with a dead-blow. This part can be a bit frustrating as access is limited. Again using the 14mm triple square socket, install the two bolts and torque them to 90Nm plus a quarter turn. You can now go ahead and put your wheels back on. Make sure to torque your lugs to spec; over torquing can lead to your studs shearing off. Your last step is to go on a short, slow test drive to make sure you reassembled everything correctly. Hopefully, this drive is quiet with your new wheel bearings installed. Your car should be riding smoothly and silently now. Wheel bearings are easy to overlook since they often develop noise slowly over time. However, after installing new ones, the difference will be immediately noticeable.